Career advancement: Ongoing technical and managerial training means you can have an exciting and fulfilling career. Pride in what you do: You're helping maintain equipment that has an impact on your community. At William Adams, our Sales team is pivotal to the success of our business. They play a key role in building loyalty with our customers. Trust and loyalty are the main reasons why our customers choose to do business with us. We understand that excellent sales people are those that not only make the sale, but create a long-lasting impact on the customer. 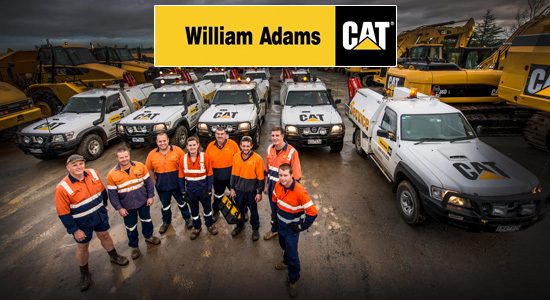 Long term customer relationships lead to repeat business, referrals and increase the William Adams brand strength and reputation. We are always looking for individuals with the right attitude, drive and motivation to become a successful sales representative. If you display strong all-round communication skills, are results orientated, persistent and determined then this could be the career for you. If you are driven to achieve sales revenue targets and enhance customer satisfaction as well as creating a positive, perception that will differentiate William Adams from the competition then this is the career path for you. In return we provide a flexible working environment that stimulates innovation, personal growth, teamwork, continuous learning and recognises performance. You may already be working in a sales related position or be working in another area and have always been interested in sales. If you think you have potential to develop a career in sales and believe you are ideally suited to the sales environment then this might be the opportunity you have been waiting for! A mechanical background and an understanding of the product is going to be beneficial however, it isn’t always necessary. If you are seeking an opportunity in a challenging, fast-paced, innovative environment where you can make a difference, we want to hear from you. To register your interest, please complete the requested work history and education information, as well as uploading your resume.